Atanas Samokovliev (also known by the nickname Atanas Samokovets) was born in 1832 in the town of Samokov. He was a trader and a public figure. He was the first Mayor of Plovdiv after the Liberation (1878). 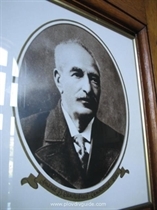 Atanas Samokovliev settled in Plovdiv and opened a textile shop there. He was elected a member of the Turkish Mejlis (parliament, national assembly). He became a member of the temporary BG government after the proclamation of the Unification of Bulgaria. A member of the BG National Assembly.